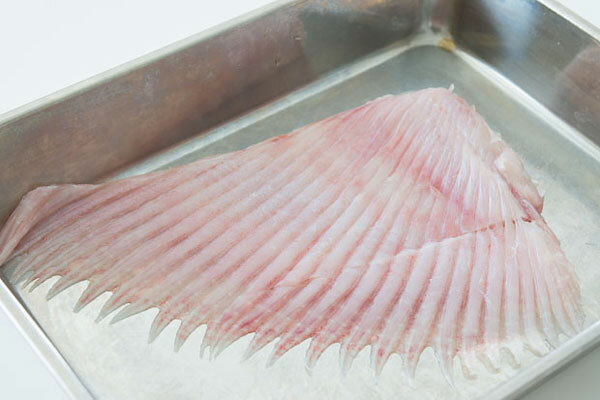 Skate is one of those oddities most people see in the seafood case and marvel at the wing-like fillets, but would never consider buying; I used to be one of those people. That all changed one night a number of years ago, after a waiter recommended the skate on their menu. Despite looking like something out of a sci-fi horror film, it was delicious. Tender and creamy, yet with a fibrous meaty texture that reminds me a bit of braised beef cheeks, skate is loaded collagen, which helps it stay moist even after being thoroughly cooked. This simple preparation using browned butter and lemon juice is essentially a Meuniere, but I’ve made a few changes for this unique fish. Because skate takes longer to cook than sole, I fry it in olive oil first, otherwise the butter will burn by the time the fish is cooked through. 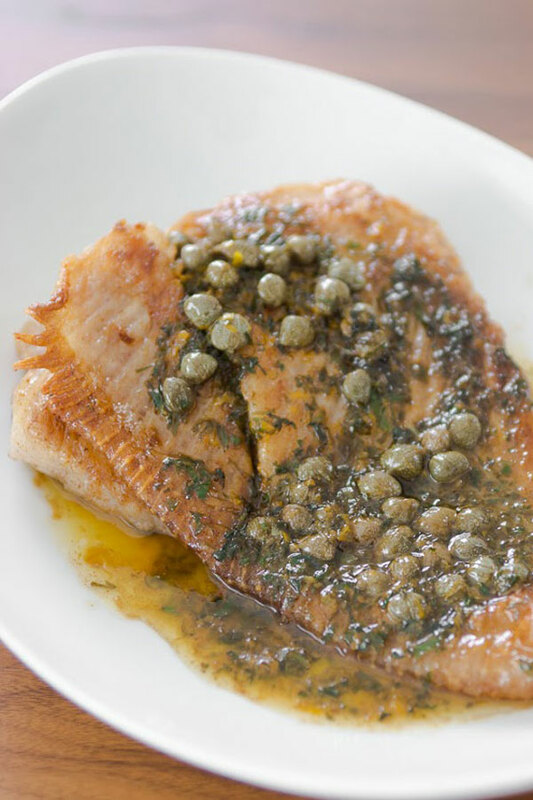 Capers add a wonderful mustard flavor that complements the richness of the fish, while the lemon juice provides a tart contrast that balances out the dish. While skate isn’t the easiest fish to find, the rest of the ingredients are pantry staples, and this dish comes together in about 10 minutes. 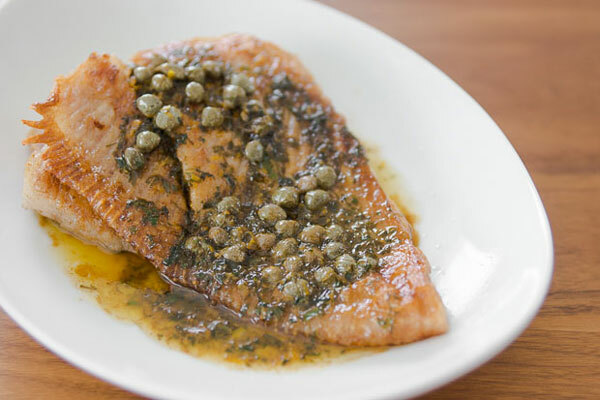 If you can’t find skate at your fishmonger, you can give this a try with almost any kind of white-meat fish. 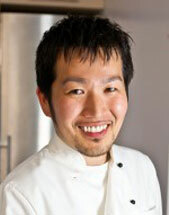 Skate is somewhat uncommon fish, but food blogger Marc Matsumoto explains it's characteristics on the Fresh Tastes blog. Use paper towels to pat the skate dry and then salt and pepper both sides. Dust the fillets with a light coating of flour. Heat the olive oil in a skillet until hot and then add the skate. Let it fry undisturbed until it's browned on one side, and then flip and brown the other side. To see if it's done you can either cut into a thick part and see if it's no longer pink, or you can use an instant read thermometer (140 degrees F at the thickest part). When the skate it done transfer it to a serving platter and then pour all the remaining oil out of the pan. Add the butter to the pan and let it melt. Once the foaming subsides the butter should start to brown. Stir constantly until it reaches a medium brown color and then turn off the heat and whisk in the lemon juice. This will spatter a lot, so be careful. Add the capers, parsley and lemon zest and then pour the sauce of the skate and serve.